1 of 1 In a medium pot, heat oil over medium. Stir in next 5 ingredients. Cook 30 seconds to 1 minute. 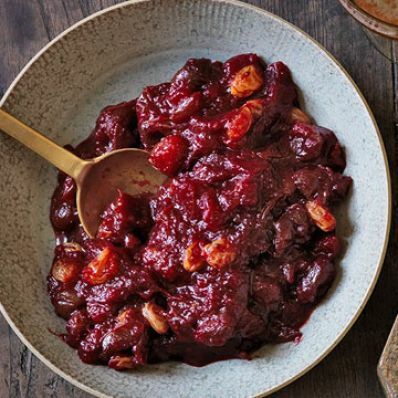 Stir in cranberries, sugar, vinegar, 1/2 cup water and salt. Bring to a simmer. Reduce heat to low and cook 20 minutes, uncovered. Stir in raisins and cook 10 minutes, until thickened.